In the last section of my MVC Templates post, I discussed how to use the Html.EditorFor() helper with complex types. Whilst this showed how you can use Html.EditorFor() and templates to produce a user interface for complex types, it didn’t show you how to bind the result when the user has posted to a controllers action. In this post I will extend the employee example, so that it displays the offices the the user selected. I Thought the DefaultBinder Supported Collections? How to Wire-Up a Custom Model Binder? 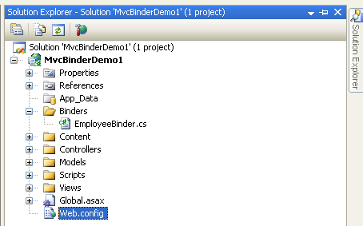 The concept of Model Binders was introduced in MVC Preview 5, before Model Binders in a controllers action we would either get values directly from the Request Context, for example Request[“Foo”] or bind directly to the Action’s parameters, for example public ActionResult Foo(string Bar). This is OK but can get untidy if you have more than a couple of Model properties to bind. Based on the request context the DefaultModelBinder will bind our Model’s properties for us, hence when creating templates it’s important to understand how to create the correct markup for your input fields using TemplateInfo. The supported types for the DefaultModelBinder are Primitive types, such as String etc, Model classes, and generic collections List<T> etc. The reason for this is that the DefaultBinder doesn’t know how to bind our List<Office> from a Select input field. Yes, but only in a specific way, I’ll discuss a Alternative Approach later in the post. For this example our requirements are to bind using a Select input field, in my opinion creating a simple Custom Model Binder is simplest way to do this. Below are the changes required to add a Custom Model Binder to my previous complex types example. First of all a little house keeping, we need to remove the Office List from the Index action into it’s own method and class. In a real situation you would get the data from a infrastructure service such as a database. Next we need to create our own Model Binder, create a folder called Binders, add a new class and name it EmployeeBinder.cs. We only want to do our own model binding for the Offices model property which is the type of List<Office>, for everything else primitive string’s, DateTime’s etc we want to use default model binding. Therefore we inherit the DefaultModelBinder, as it would be silly to reinvent the wheel when the default does most of what we want. Next we call base.BindModel this does a all the Default Binding for us and returns an object representing our model, we then convert the bound object to our EmployeeModel using the as keyword. We now have a bound EmployeeModel, now we need to add some code to do our custom binding for the Offices property. First we need to get the posted value for Offices, the preferred way is via ValueProvider.GetValue, rather then using the Request Context directly for example Request[“Foo”]. Next we check that a value was posted for Offices. Then we remove any ModelState errors for Offices, as we will be binding Offices ourselves (there will be conversion errors from the call to base.BindModel). We know that the Offices value will be posted as an encoded set of Office id’s with multiple values delimited by a commas. All we do is split the string value will got via ValueProvider.GetValue and create a new List<Office> using just the posted Office id’s, we then set the model.Offices property to this List. We catch any FormatExceptions which occur, for example if an id was posted that was not the type of GUID, the exception is added to ModelState for use in ModelState.IsValid and Html helpers. Any unexpected exceptions are thrown. Finally we return the Model, hopefully with the Offices model property populated with the ids of the Offices the user selected. 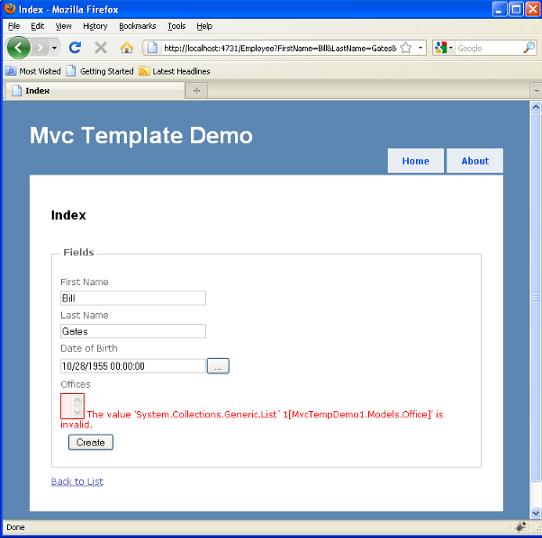 For a particular model the easiest way to tell the MVC framework to use your custom model binder is by decorating the model with the ModelBinder attribute. The ModelBinder attribute takes one parameter the type of your model binder. The ModelBinder attribute adds your ModelBinder to the ModelBinderDictionary. You can also add your to your model to the ModelBinderDictionary via the Application_Start() event in the Global.asax file. I prefer the former method as it is more obvious what’s going on and feels more like convention over configuration. This change just selects the Office by it’s id using the model which was bound using our custom model binder. In a real scenario this would be a call to an infrastructure service such as a database. Debug\Employee\Index provide a First Name, Last Name and Office then click on the Create button. As you can see the Office selection is now populated with the rest of the information. Apart from the obvious missing data service, the use of a magic string in the Custom Model Binder makes the code a little bit fragile, a simple change would be to select the property by type. This would mean you could re-use the Model Binder for any Model that has List<Office> type regardless of what the property name is. In summary using magic strings means you are binding using the property name rather than the type, therefore losing the opportunity of code reuse by type and affecting the way you would unit test the Model Binder. As mentioned binding to Lists and Collections is supported, but it’s a little bit specific, namely you need to use hidden fields/textboxes, Phil Haack has written an excellent post on this subject. Whilst you could get the DefaultBinder to work with a select field, a custom Model Binder in my opinion is a more elegant approach. One of the reasons the MVC framework is brilliant is – if it doesn’t quite do what you require just extend the default behavior. 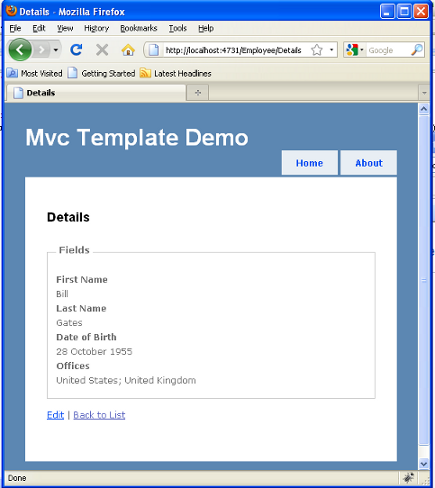 I hope this post demonstrated how easy it is to create your own Model Binder and that in the MVC world you rarely need to compromise on your Models or User interfaces because if it doesn’t work for you just extend the functionality. For more tips on Model Binders see Scott Allen’s excellent post. Great article. In the custom model binder, is there a way to re-validate the model after you update it with the List of Offices? Say your Offices model had DataAnnotations on it. Is there a way to validate the model and have it update the ModelState with any errors? Thanks for this – very concise. I’m stuck at an architectural challenge, that you touch on in your Best Practice section. In real life, the Offices are out in a database somewhere, so how do you go fetch the appropriate record in a ModelBinder. I agree that the ModelBinder should not be calling directly to the database, but the only other option I can see is to add all the Offices into the ViewBag (or similar) and iterate through them via the controllerContext. I echo Andrew Knox here in saying finally, a decent post on how to easily extend the default model binder. It’s worth noting that you can also use the ModelBinder attribute on an controller’s action parameter, which is useful if the custom ModelBinder is required only for certain actions.